Sunny Blackpool was the venue for the club’s third fixture in this season’s northern league. The club was deprived of many senior athletes for a variety of reasons, so it was left to the club’s youngsters to fill the breach, with thirteen under 17’s stepping up to the mark. 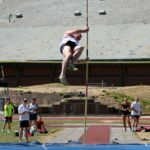 It was the field athletes who scored the most points for the club, as they appeared the least affected by any absences. Matt Ingram was again a double winner, taking first place in the long jump(6.81m) and the triple jump (13.11m), with Jamie Hopkins winning the ‘B’ triple (11.57m). Kai Finch (1.95m) and Owen Southern (1.80m) won the high jump events. Katie Moore (8.90m) & Tayla Reilly (8.46m) can be pleased with their first efforts at the triple jump. 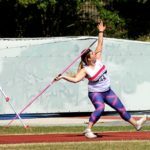 Paula Murray’s best events were in the javelin (32.40m) & hammer (33.70m) securing first & second place respectively, while Jenny Pyatt did likewise in the Discus (43.19m) & shot (10.52m). 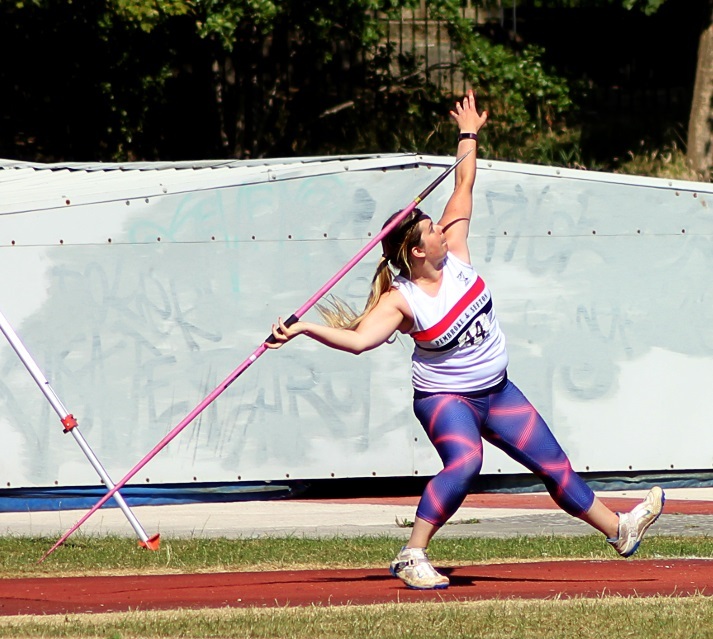 Nicola Swift threw a pb in the hammer (13.61m) to finish 4th ‘B’. Imogen Ayres (1.50m) was back to top form to take 3rd place in the high jump, with Debbie Dasse (1.45m) finishing 2nd in the ‘B’ event. 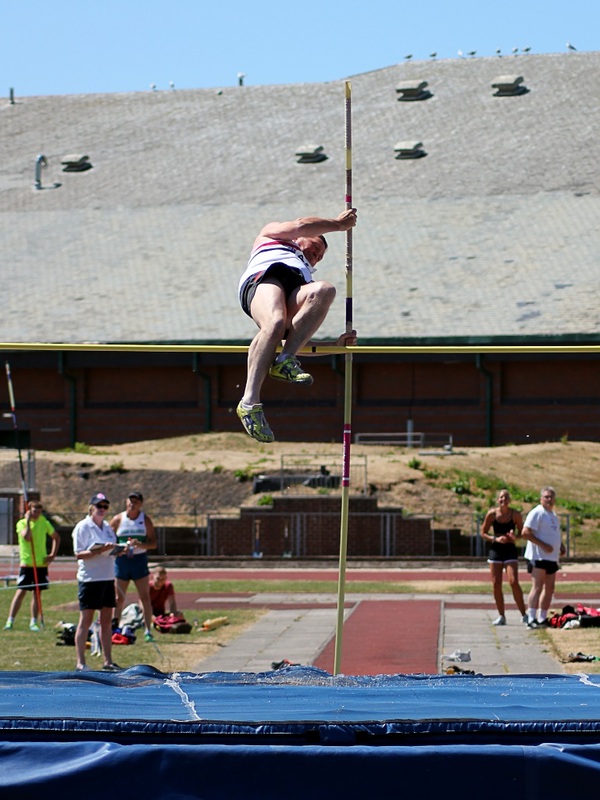 Debbie also competed in the pole vault for the first time & finished in 3rd place. Veteran, Dave Brown was in fine form finishing 2nd in the Discus (29.64m) and shot (9.89m) & first in the ‘B’ hammer. Fellow veteran, Mark Line also contributed to the points score with a throw of 33.09m in the hammer & 38.72m in the javelin, while Will Hynd’s javelin throw (39.51m) took 4th place & Callum Hynd’s shot putt(7.28m) was good enough for 2nd place in the ‘B’ event. 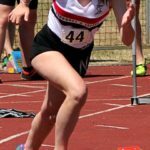 There was only one individual winner on the track, with Maddie Firth-Cook taking the 400m ‘B ‘hurdles event (72.6) , Lucy Townson was 5th in the ‘A’ event (65.9). Flossie Dickinson ran her fastest times in 3 years with an excellent 3rd place finish in the 800m (2:38.2) and a time of 5:47.2 in the 1500m. However, a number of U17’s excelled on the track. 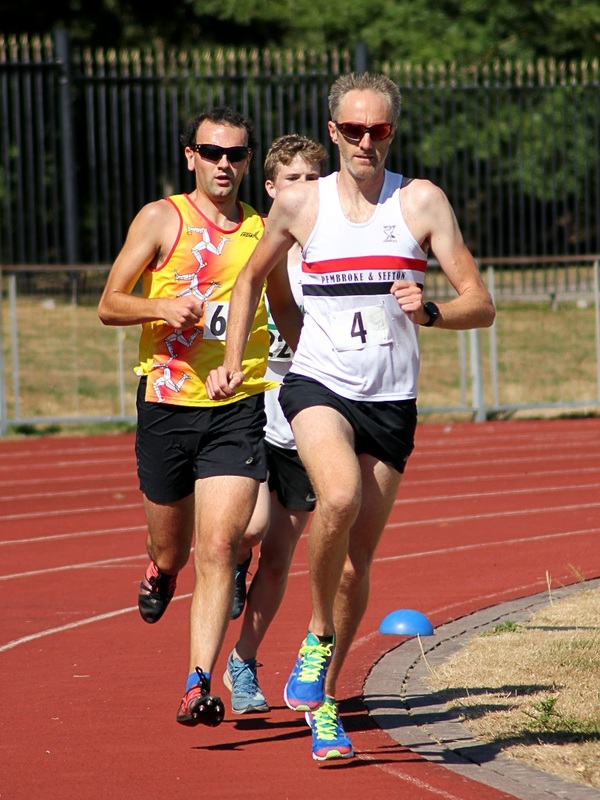 Oliver Sutcliffe was second in the 1500m, knocking 7 sec off his pb (4:31.8) with Fletcher Foster knocking 6 sec off his time for the 800m (2:13.8). Hannah Doyle was reliable as ever in taking 2n place in the ‘B’ 3K. 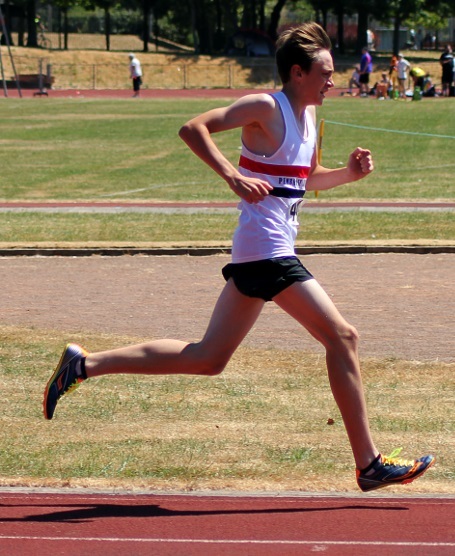 Despite not securing top 3 finishes many of the youngsters improved their own pb’s by some margin. 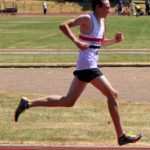 Callum Garvey improved both of his sprint times with 11.9sec in 100m & 23.6 sec in 200m, with Owen Southern’s 200m time (23.1) another pb. 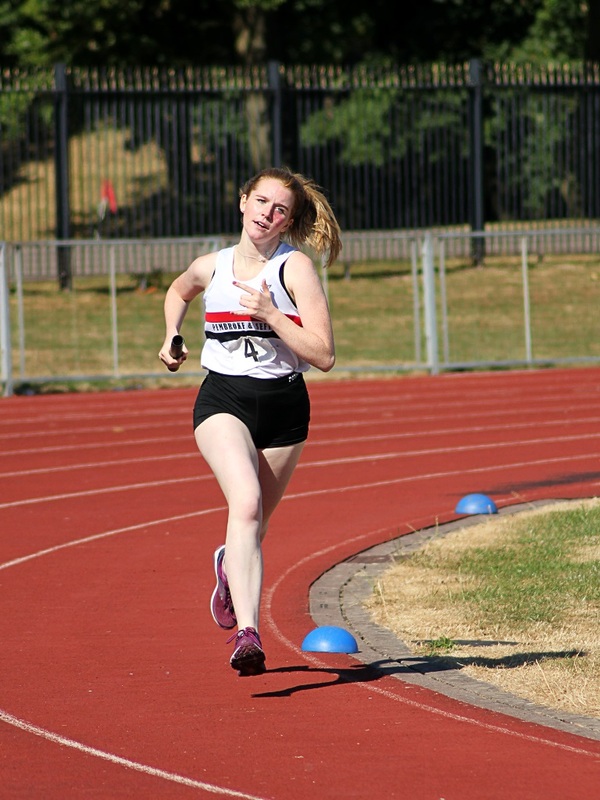 Tayla Reilly 100m (13.9), Katie Moore 200m (29.2) and Lucy le Marinel 100m (14.3), 200m (29.4) all improved on their sprint times. 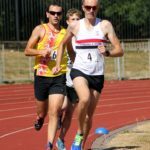 Veteran’s, Mark Wynne (16:52.9) and Bernie Murphy (18:20.7) had the unenviable task of running 5K in the afternoon heat, but both declined the water station en-route. There were a number of other athletes who stepped in at the last minute to fill gaps in the team sheet. 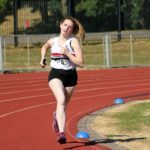 Bethany Swift (1500m), Charlotte Mawdsley (3K) and Abby Kelly (800m), but all three made valuable contributions to the points total. Subject to scrutiny, it looks as though the club finished in 5th place on the day, behind Blackpool but ahead of Liverpool Harriers. Team Isle of Man, Leigh Harriers & Manchester Harriers took the first 3 places. With one fixture remaining, this result should ensure a 3rd place finish to the season. ← Congratulation to Phil Taylor & Sophie Hine.